To power Cadel's hopes for winning this year's Tour, Ridley is unleashing a gamut of aerodynamic technologies in their latest TT bike, the Dean. According to Ridley, the most disruption of airflow in conventional bicycles is concentrated near the fork and the rotating spokes of the front wheel. Slotted airfoils, gimmicks used in the aerospace industry to create more lift with lower drag and consequently lower power input, are now used in this bike on the fork and seat stays to convert as many disruptive flows as one can get to a more uniform laminar as possible, without compromising structural integrity through other redesign schemes. What is interesting though is another feature they are calling boundary layer technology. First if you're a tech head, read this material about boundary layer theory. Ridley’s Aero line will also incorporate their proprietary boundary layer technology or R Surface™. The boundary layer is thin band of air that “adheres” to the surface of an airfoil. A thin boundary layer allows the air mass to travel around the frame smoothly. Using data from extensive wind tunnel testing during the painting process, Ridley engineers applied texture to strategic locations on the frame. Air moving over the textured surface becomes excited, which causes it to travel smoothly around the frame instead of detaching, creating speed-sapping drag. The use of R-Surface™ on the new Dean and Noah makes Ridley the first company in the bicycle industry to use this aerodynamic technology. Click here to read the original company brochure on the bike. 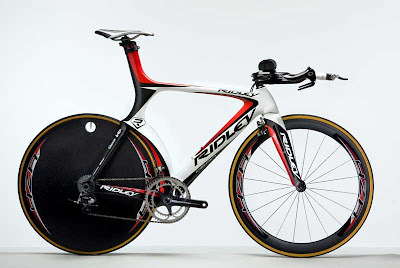 The Sydney Morning Herald says : Evans will ride a custom-made Ridley time-trial bike that has been developed around his build, position and style. The bike, named the Ridley "Dean", has been two years in the making and results from tests show it saves 15 watts of energy when it is ridden at 45kmh. Evans will follow a minute-by-minute schedule after he wakes and prepares for the time trial. Ridley, what we're all really wondering is : Can this bike beat Koga Miyata's Million Dollar bike?! Someone touted that as the fastest bike in the world, now we're all sitting here confused about which one to buy - spend a million dollars for Koga or spend 4000 bucks on your frame. Its a really tough decision. Sigh. Time to go for a run. That bike didnt even get a podium in today's time trial. look at the bright side, he whooped Fabian. While its speed is apparently suspect, that is one pretty bike. The lines are magnificant. I seem to go gagga over bikes the way I used to drool over cars a few decades ago. I am not certain that represents progress . . . Anyone know what bike Shumacher rode to win? It wasn't a Specialized Transition I know that much. Answered my own question, it was a Walser. I think I am right in saying that he didn't bother with skin shoes, I wonder why? Isn't that the same thing that Zipp did with their wheels and golf ball manufacturers have been doing forever?